Despite being a relatively new way to print your favourite photographs, canvas printing has rapidly become the best way to inexpensively turn your images into personal works of art. With modern cameras becoming ever more capable of producing high quality photographs, canvas printing is an accessible way of transforming your snaps into wall art that you would be proud to hang anywhere in your home. Position – Working out where your print is going to hang will help you choose the size and shape of your print. Measure the space you want to fill to give you an idea of what you need. Larger spaces can often look better when several prints are arranged together, rather than having one huge print hanging by itself. Quality – Be sure to choose a high resolution photograph which is sharp and vibrant in colour. Any blurring or darkness will only be accentuated by the enlargement process. The more pixels your picture has, the better the finished print will be. Photographic software can be used to enhance resolution, helping you maintain picture quality when printing a larger image. Orientation – While most photographs are rectangular in shape, some will benefit from being cropped into a square image. Check the main subject of the photograph to see whether a rectangular or square print will be more suitable. 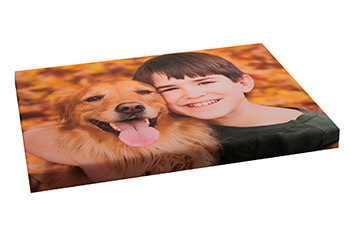 Wrapping – Unlike conventional print framing, canvas prints are wrapped around the frame to produce a 3D effect. Make sure that the main subject of the photograph is central and that you choose the correct wrapping effect for each particular picture. If you get all of these factors right you will have a unique canvas print to be proud of. If you are ready to create your canvas photo print, simply download our free software and add your image.